Need to Connect in the Most Reliable, Fastest Way? Don't Have a Wireless Router? The Wii LAN Adapter is the Solution! 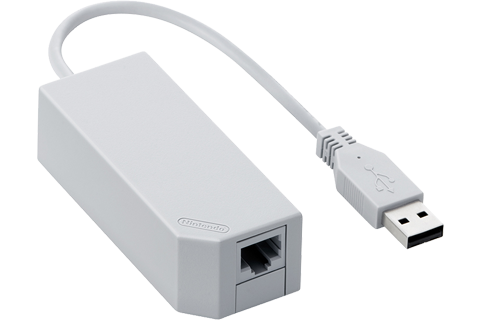 The Wii™ LAN Adapter connects to an open USB port on the Nintendo Switch﻿™ dock, Wii U™, or Wii™ console and makes a direct connection to your broadband modem via Ethernet cable (not included) possible. This direct connection removes the risk of wireless network delays or issues when playing games online. Click here for the Wii LAN Adapter Manual. Not sure how to connect your Wii LAN Adapter, Ethernet cable, and broadband modem? Click here for Nintendo Switch instructions. Click here for Nintendo Wii U instructions. Click here for Nintendo Wii instructions. The Wii LAN Adapter is not required to connect your Nintendo Switch dock, Wii U, or Wii console to the internet if you want to connect via a wireless router. For information on setting up your connection to a wireless network, click here.